Three out of four food hubs in the United States are breaking even or turning a profit. 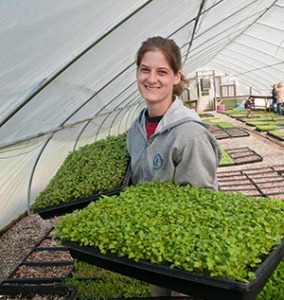 One out of three food hub operators are women, and one out of five are people of color. These statistics and more were revealed in a recently-released National Food Hub Survey. The 2015 survey, conducted by the Michigan State University Center for Regional Food Systems and the Wallace Center at Winrock International, came on the heels of a similar survey in 2013. More than 150 food hubs were included in the study, which was designed to identify food hub economic growth patterns. Fisk, along with Jeff Farbman of Winrock International and Rich Pirog and Jill Hardy, both of Michigan State University, spoke about the survey via a webinar conducted by the National Good Food Network. “It’s a detailed survey,” says Pirog. Detail is important, according to Fisk, because numbers tell stories, especially to people who can help fund food hubs. Twenty-five percent of surveyed food hubs had gross revenues between $200,001 and $500,000. Nineteen percent of hubs surveyed had revenues totaling between $1 million and $2 million. Of the surveyed food hubs, 38 percent are for-profit, 36 percent are nonprofit, 19 percent are cooperatives, and 3 percent are publicly-owned. Regarding business structure, 52 percent of surveyed hubs are hybrid organizations, 29 percent focus on farm to business or institution, and 20 percent are built on the farm-to-consumer model. Forty-six percent of surveyed hubs feature six or more product categories while 23 percent carry four to five. The vast majority (92 percent) of food hubs surveyed sell fresh produce and herbs. Sixty-five percent carry meat, poultry and eggs, and 53 percent sell processed or value-added items. For all food hubs in the survey, fresh produce accounted for 58 percent of sales revenue. Of the food hubs surveyed, the median number of suppliers per hub is 36. 46 percent of surveyed food hubs relied on at least one non-sales revenue source. Thirty-two percent of food hubs included in the survey are less than six years old, and 31 percent of food hubs have been in existence for less than three years. Sixty-one percent of food hubs in the survey provide assistance to producers and suppliers in forming a strategy for food safety. The median number of employees at each surveyed food hub is nine. Reading between the lines, and especially comparing 2015 stats with results from the 2013 survey, Hardy sees optimism amid challenges. One of the challenges that many food hubs face is the fact that many people don’t even know that they exist, much less what they do. Pirog believes that spreading the word about food hubs and the good work they’re involved in is important. And that message will be more even more effective, he believes, if it’s based on hard numbers. “We need to have soundbites based on research to show that food hubs can make a difference,” he says. Farbman feels that food hubs also have an impact in ways that are not measurable, such as providing fresh local food, supporting local farmers, and building community. “Food is more than calories and nutrients,” he says. Fisk, Pirog and other experts are optimistic that food hubs, and other local food selling outlets such as farmers’ markets and CSAs, will continue their upward momentum. According to statistics from the Wallace Center at Winrock International, the number of food hubs in the United States increased 288 percent from 2007 to 2014. Currently, there are about 350 food hubs in the U.S. with a combined revenue of half a billion dollars. Ninety-eight percent of these food hubs foresee increased demand for local foods. Data for the 2015 survey was taken between March 18 and May 17, 2015. One-third of those surveyed responded and statistics from 151 surveyed hubs were used to compile the report.